Growing up, almost every Sunday afternoon meant grilled cheese sandwiches and tomato soup for lunch after church. It’s a classic for a reason! 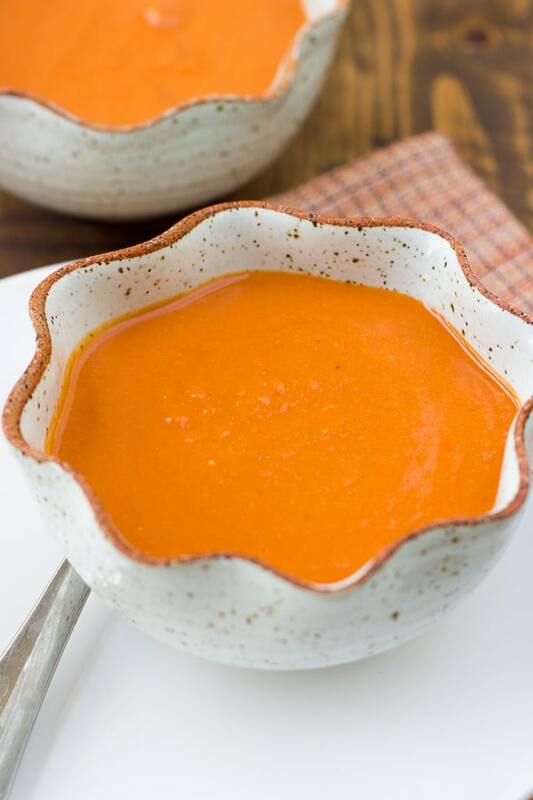 There’s nothing better than warm, savory tomato soup with a toasty something for dipping. These days my 4-year-old agrees. Whenever I make something he likes he tells me, “Mommy make this dinner all the time!” I have such a love for trying new recipes that we don’t often make the same thing twice. But I’ve realized kids love meal repetition and I want my boys to grow up with family food memories and traditions. It also makes meal planning so much easier to have meals like Sunday afternoon grilled cheese or Friday night pizza night. When I was a kid we always ate grilled cheese and tomato soup with sweet pickles and apple slices. I almost can’t have this meal without a sweet pickle or I feel like something is missing! This soup is the most delicious tomato soup I’ve ever made. It is heads and shoulders above the canned condensed soup I grew up on. (Sorry Mom!) It is velvety smooth with a rich tomato flavor. It pairs perfectly with gluten-free grilled cheese or these breadsticks. If you can eat cheese, try grilled cheese with bacon, thinly sliced green apple, and sharp white cheddar. All smothered in butter, then toasted to perfection of course. That combination is the grilled cheese of my dreams. And this soup is the tomato soup of my dreams. It uses cashew cream instead of regular cream. 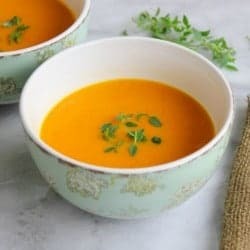 Aside from making it dairy-free, the cashew cream also lends a sweet note to the soup which is heavenly against the acidity of the tomatoes. If you have a nut allergy a little coconut cream works great instead. If you’re a fan of the Nordstrom tomato soup, give this one a try. It tastes so much like it! Enjoy! 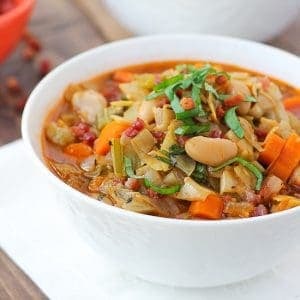 This soup is so flavorful and comforting you’d never guess it doesn’t include any cream! For the gluten-free all-purpose flour I use Bob’s Red Mill 1-to-1 Gluten-Free Baking Flour (not affiliated). You can use any gluten-free all-purpose flour you have on hand. If you have a nut allergy this soup is delicious with a little coconut cream added in place of the cashew cream. This soup also freezes very well! Pour the tomatoes through a strainer with a large measuring cup underneath to collect the liquid. Set the tomatoes aside. Add chicken stock to the tomato liquid until you have 3 1/2 cups of liquid. Set aside. Heat a large dutch oven over medium heat. Add the onion and cook until softened, 5-7 minutes. Add 2/3 of the reserved tomatoes, bay leaf, and brown sugar. Cook for about 10-15 minutes, stirring occasionally until the tomatoes carmelize slightly and sizzle. Add the tomato paste and flour and cook for another 2 minutes while stirring. Pour in the tomato liquid/stock mixture while stirring and scraping the bottom of the pan. Add the remaining tomatoes then bring to a simmer. Cook for 5-10 minutes. Meanwhile, combine the cashews and water in a high-speed blender. Blend until smooth and creamy. Remove the soup from the heat. Add the soup the blender with the cashew cream and puree in batches until smooth. Alternatively, you can puree the soup using an immersion blender, then stir in the cashew cream. Add the baking soda, then season to taste with salt and pepper. Add more stock to thin if necessary. Enjoy! 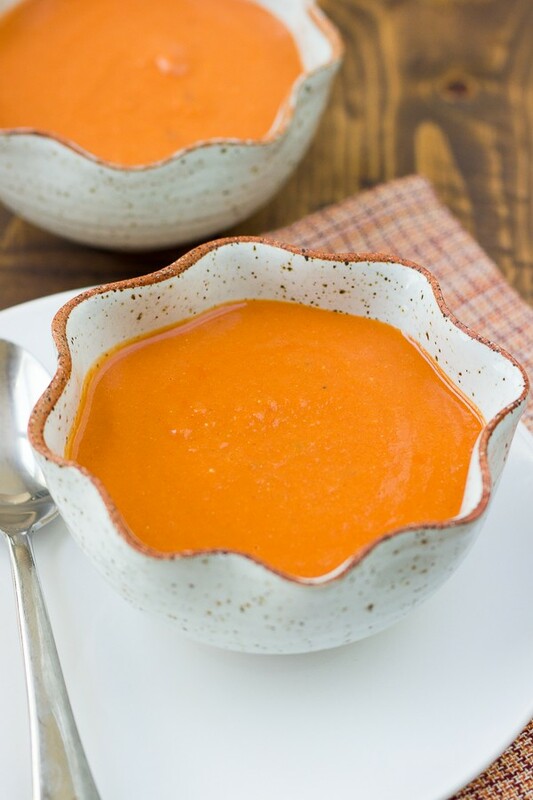 Oh my goodness this tomato soup looks SO good, and I love that it’s dairy-free to! And your idea for a bacon/apple/white cheddar grilled cheese to go with it/ Genius! Can’t wait to give it a shot! !